Two-stroke enduro bikes are alive and well, thanks to their easy starting, simple maintenance, lightweight feel, and a fun factor that is often unmatched by any four-stroke competitor. This has all been in the hands of primarily, KTM, although Yamaha is also there. Until recently there haven’t been many options. 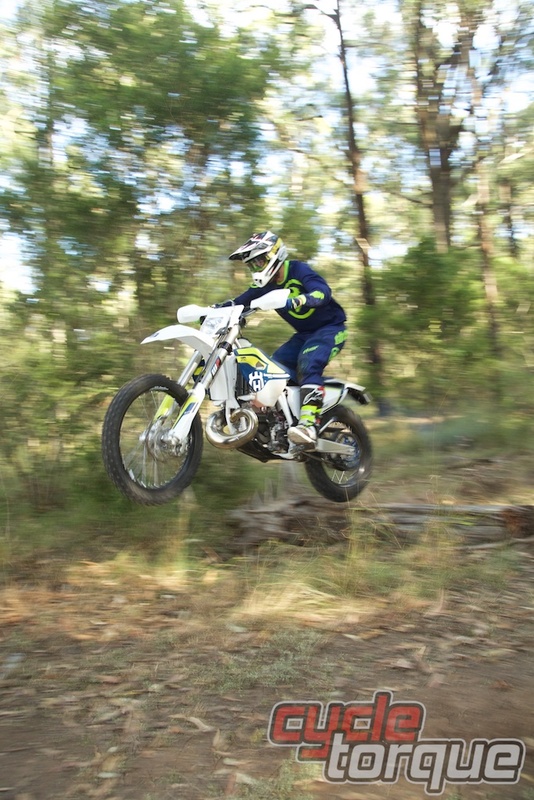 The Husqvarna TE250 has been around for years, and has no doubt been a serious player in the market, but it has never managed to take the crown away from KTM. The 2016 TE250 may not be ‘all-new’ and revolutionary but it takes a very serious shot at being the best bike in its class. At the heart and soul of the Husky is its 250cc two-stroke engine. Featuring a six-speed transmission, electric and kick starting systems, Brembo hydraulic clutch, dual-curve CDI ignition system, Boyesen reed valve intake, and a spring tune-able power valve system. Low-end torque and manageable high-end power are the product of all the above features, and the adjustability of the power valve and CDI can customise the power output even further to suit almost any rider’s needs. The chassis is manufactured from chromoly steel, and is laser cut and robot welded into shape by folks at WP Performance Systems, they’re the same guys who design and build WP suspension in case you were wondering. A polyamide (plastic composite) subframe sits comfortably out the back and is accompanied by a one piece aluminium swingarm. Below that, a Husqvarna-developed linkage rear shock system does its work, offering a combination of comfort and performance. WP Suspension works with the linkage system in the form of the WP dual-compression control rear shock. It’s a completely adjustable design, updated for 2016 with new internal valving. Up front, WP 4CS front forks get to take on the trail before anything else, featuring a unique set-up where the left side of the fork is designed for compression damping, and the right fork is set up for rebound damping only. Billet CNC machined triple clamps house the 4CS forks, and are modified for 2016 to include a 22mm offset clamp, down from 24mm. The front axle shrinks in size, down from 26mm in diameter to 22mm in diameter, and front axle moves 2mm forward in the fork clamp shoes. To breakdown the technical talk, Husky pulled the triple clamps closer to the bike but moved the axle further away. In theory, these two changes cancel each other out so its hard to see why they would do this. Husqvarna says it creates extra flex by pushing the axle out and making the axle smaller, also helping to provide more feel and comfort in the front-end. An 11-litre fuel tank offers some seriously long range without being too big and bulky. It’s 1.5L larger than the standard sized fuel tank on any other enduro bike. This alone will be enough to sway a few sales in the direction of the Husky. Air filter access is easy, with a few simple clips holding the plastic side shroud on. Simply unclip the shroud and the air filter is right there. The air filter is secured in place with another clip-in type system meaning no tools are required to remove or install the air filter. It should also be noted the standard air filter comes directly from Twin Air, meaning a quality aftermarket air filter comes as standard equipment on the TE. The TE fires up easily with the electric starter, or just as easy with the kick starter if you forget about the button. The controls are all quite comfortable, with plenty of adjustment in the levers and ’bar mounts. The speedo is tucked away nicely behind the headlight and there isn’t too much in the way of bulky ADR rubbish hanging around the cockpit either. Out on the trail, the Husky is quite comfortable and easy to adapt to. The suspension is somewhat soft and plush, which takes any potential harshness and vibration away. It has good manners through turns and doesn’t throw up any surprises when you come across holes, edges or any other sketchy terrain often found on the trail. Moving onto our special test loop, we pushed the TE a bit harder and were very impressed with its balanced and agile set-up. Two-strokes give a lightweight feel through the tight stuff that just can’t be replicated by a four-stroke, and the Husky does that exceptionally well. 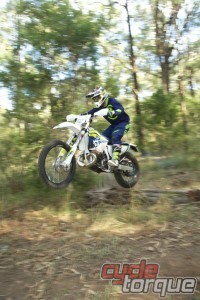 It’s responsive to changes in direction and handles tight ruts and berms very well, yet remains quite stable at speed. 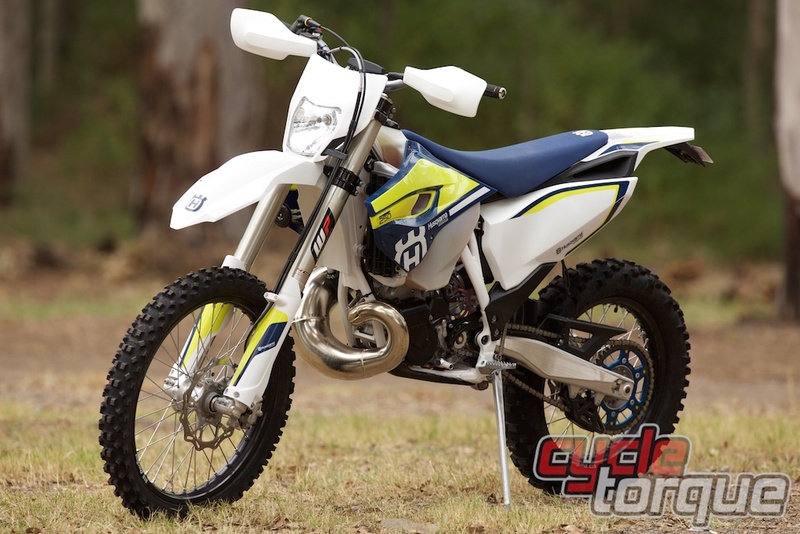 If you’re into desert racing, blasting dirt roads or going ridiculously fast the standard set-up might be a bit soft and twitchy, that being said if you’re on a TE250 and doing any of that style of riding, you need to take a better look at the Husqvarna range and think about what bike you really need. Back to the suspension, it will work well in standard form for most people who will throw a leg over the TE. While being soft, it’s not bouncy, deflective or unpredictable. Taking on the odd fallen tree branch or launching off a drop-off is no trouble as the Husky holds up well in the stroke under load and doesn’t want to throw you off as it unloads the fork and shock. The fork offset and axle changes made for 2016 don’t appear to be a big deal, without having a bike back to back it was really hard to notice any differences. Even if we did have the previous model, it’s unlikely any weekend warriors like us will notice. 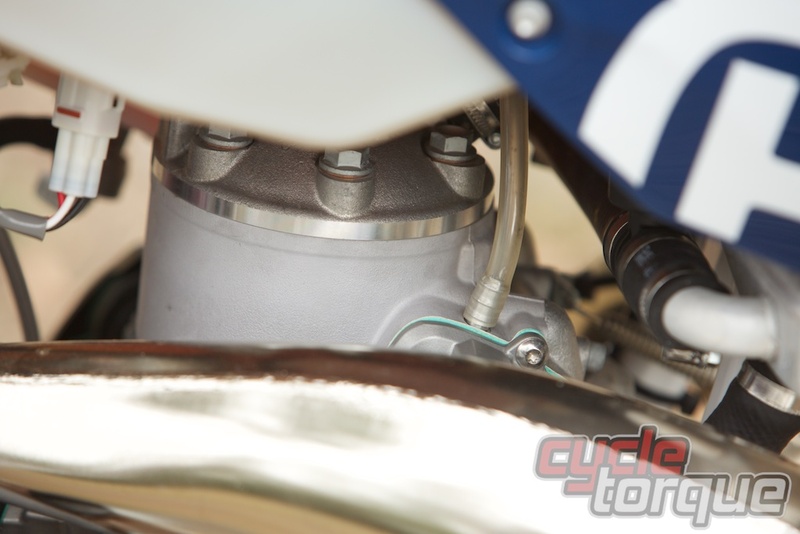 The engine is everything you would hope for out of a 250cc two-stroke. It’s responsive, builds revs quickly, and requires a bit of aggression from the rider to really make it shine. It’s a machine which produces its power in a pretty well-mannered way for a two-stroke, not quite to the level of the TE300, but good nonetheless. A quick flick of the Brembo hydraulic clutch and handful of throttle really wakes the 250 up and gets you into that fun, revvy part of the powerband. It’s pretty mild off the bottom – great for when you’re riding slow – and makes great power through the mid-range. The Husky pulls well if you have the courage to keep holding the throttle wide open. It’s a fun style of power that won’t go ripping your arms out, but at the same time you have to ride with some aggression if you plan to make the most of the powerplant. We never got to test how far the 11-litre tank actually went, but with it being the biggest tank in class it’s almost a sure thing you’ll get further than your mates. Standard tyres have to go through ADR regulations and have to be road safe which means the selection is limited for the OEM’s, Michelin enduro tyres do the job but if you’re usually riding in the bush upgrade to a decent set of knobbies and you’ll be rewarded with improved grip and handling. The Brembo brakes are awesome, the feel is unmatched and stopping power is excellent. There is just something about a good two-stroke that makes it edgy and fun. Whatever that something is, Husqvarna has it. It’s as good as any other 250cc two-stroke enduro bike you can currently throw a leg over. In fact, you could easily make a case to say it’s better than the KTM. It has more standard features than the KTM and comes better equipped. It has equally as good spare parts backup, powerparts selection and a large dealer network too. The only negative we can put against the TE, is the same negative that any 250cc two-stroke has, its in a niche where it only fits a certain style and type of rider. Don’t let that scare you off though, as the TE250 is a great bike and is ready to ride, right from your local dealer’s floor.